Vasishtha (वसिष्ठ, Vasiṣṭha) = literally: “the richest”; name of a famous vedic saint. According to scriputes he owned Nandini, the legendary cow of prosperity. It made all wishes of the Brahman came true. Vasishtha is known for his conflicts with Vishvamitra. He is said to be one of the 7 Saints represented in the constllation of the Big Dipper. Perform Adho Mukha Svanasana . Shift onto the outside edge of your left foot, and stack your right foot on top of the left. Now swing your right hand onto your right hip, turn your torso to the right as you do, and support the weight of your body on the outer left foot and left hand. Stay in this position for 15 to 30 seconds. 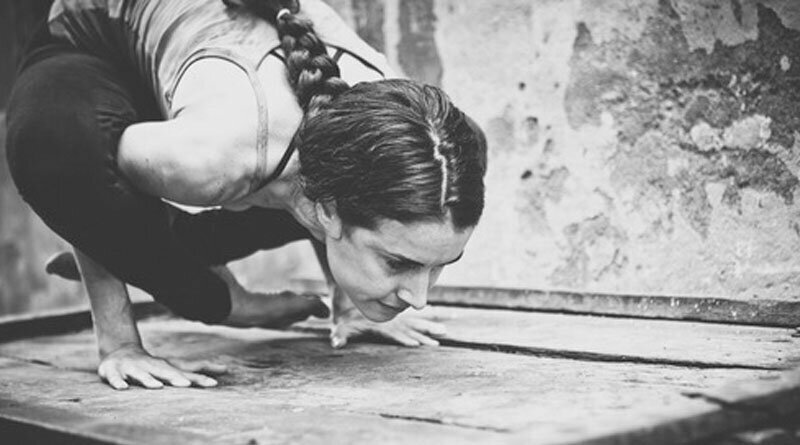 Come back to Adho Mukha Svanasana, take a few breaths, and repeat to the right side for the same length of time. Then return to Adho Mukha Svanasana for a few more breaths, and finally release into Balasana . Students with serious wrist, elbow, or shoulder injuries should avoid this pose. Beginners often have a difficult time sustaining this pose, even with the soles pressed to a wall. Perform Adho Mukha Svanasana with your heels up on a wall. Measure the distance between your right foot and right hand, then step the foot halfway to the hand. Keep the right foot on the floor for support and turn the toes out to the right. Then shift onto the outside of the left foot, press the sole against the wall, and turn onto the left hand as described above. In this position the bent leg will provide some extra support. 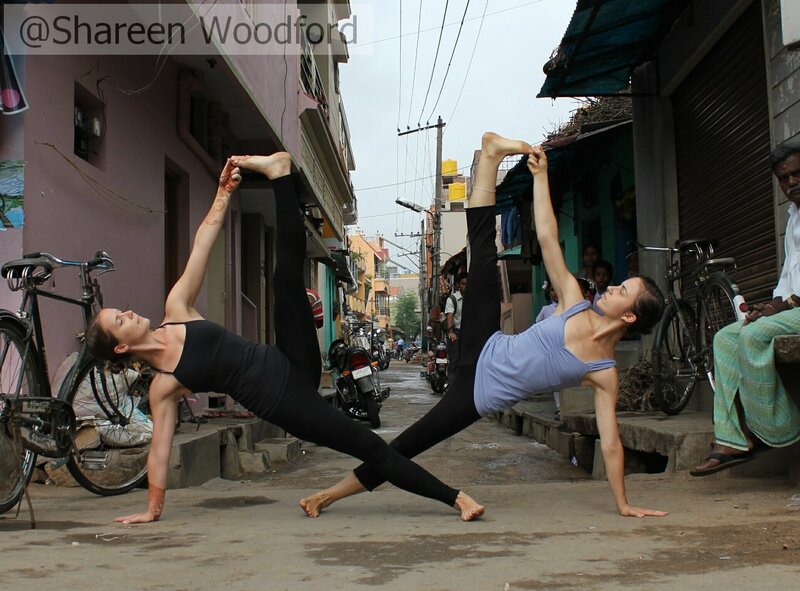 Step back to Adho Mukha Svanasana at the end of your stay, then repeat to the other side. 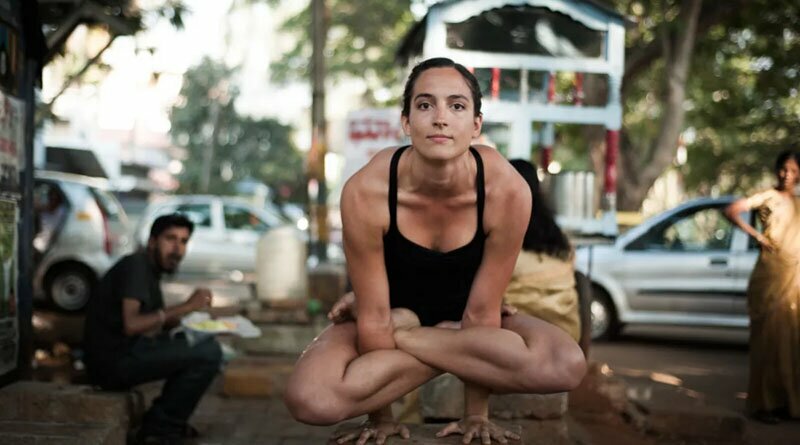 The full version of this pose, as taught by B. K. S. Iyengar, raises the top leg perpendicular to the floor. Perform the modified version as described above, either supported or unsupported by the wall. Exhale, bend the top knee, and draw the thigh into the torso. Reach inside the bent leg and use the index and middle fingers of the top hand to grab the big toe. Secure these fingers by wrapping them with the thumb. With an inhalation, stretch the leg perpendicularly toward the ceiling. Hold for 15 to 30 seconds, then release the grip on the toe, and return the top foot to its original position. Repeat on the second side.